Snowbear Lodge has it all and then some! When you step inside our luxury lodge you'll know that you are home! Our 2400 SF home with 4 bedrooms and 3.5 baths features it's own private Hot Tub, WIFI, attached two car garage, 5 Color TV's, and a fully stocked, gourmet kitchen! The huge living, dining and kitchen area is a popular gathering place for our guests. There is a 55" flat screen HDTV in the Living room and 32" flat screen TV's in each bedroom.Local cable TV provides 140 + channels for viewing. Snowbear has comfy pillow top beds & clean, well maintained linens.The Master bedroom boasts a King bed, gas fireplace, color TV w/ remote and a private bath. The other two upstairs bedrooms also feature Quality King Beds, TV's and hall bath. The downstairs garage level bedroom has a queen and twin bed as well as it's own private bath and color TV with remote. Adjacent to the garage level bedroom is Snowbear's indoor enclosed 4 person hot tub. There is also a larger exterior hot tub located at the clubhouse for guest use. Snowbear is steps from the forest and trails for winter snow hikes and casual hiking/biking during other Tahoe seasons. 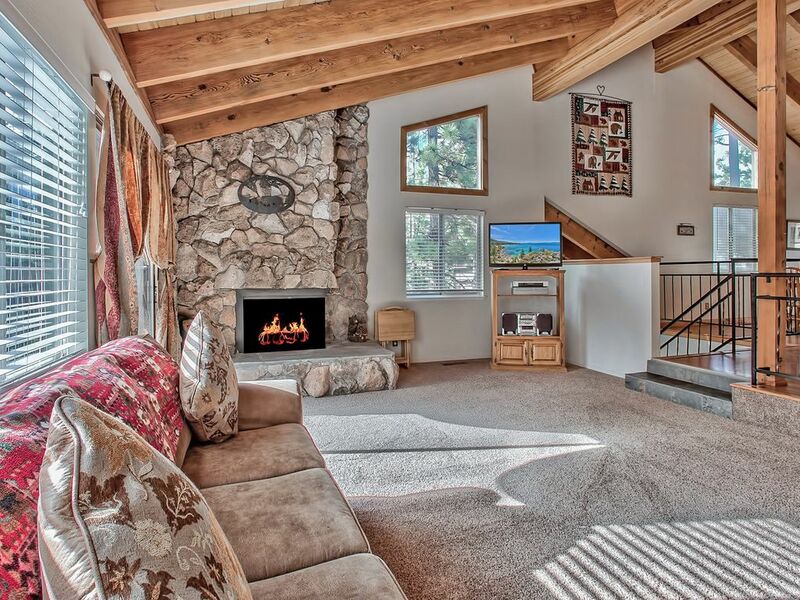 The home overlooks the mountains of Heavenly Valley. As our guest, you have use of the Lake Village heated pool, (Summer/Fall) Tennis courts, ping pong and pool tables, saunas,showers, restrooms, picnic area BBQ fire pit, and deluxe kids play areas. I am a retired Police Sergeant with nearly 23 years of service. I enjoy hiking, photography, refinishing antique furniture, and doing volunteer work in my community and with my church. I visited Tahoe for the first time in my early 20's and fell in love with the incredible beauty of the lake,meadows, and mountains. I actually ended up purchasing 3 homes in this location including Snowbear.The community of Lake Village is in a perfect location! It is quiet and wooded, yet is only a mile or less to the beaches, stores, Heavenly Gondola and casinos.There is a nice shopping center just 1/4 mile up the highway for grocery needs. We have a clubhouse available for guests which includes a swimming pool, tennis courts, saunas, pool and ping pong tables. (Swimming pool and tennis courts closed in the winter) The property is well maintained and heavily wooded and It is surrounded on three sides by forest. The roads are well maintained by our own staff and snowplowed day and night to keep them open in the winter! When you arrive home you have comfy beds as well as a toasty and inviting private hot tub at your disposal! We have taken extra care to provide the extra amenities that make this a home away from home. This includes WIFI a private hot tub, a gas BBQ on the deck, comfortable beds, a fully equipped kitchen from Range oven and microwave to blenders, crock pots and spices. The little things are covered too, including a hair dryer, washer and dryer and soap to handle your laundry. There is a TV in each bedroom as well as a 40 ' flat screen the living room. Our roomy 2 car garage provides security and shade for you vehicle in the summer and a welcome reprieve from the Snow in the winter months. For the price of a hotel room you will get a fully furnished 2400 SF home in a QUIET location with everything you need to save money on your vacation getaway. 3 Full bathrooms and one half bath in the living room/kitchen area. Located in Lake Village a family/guest friendly resort! An itty bitty lake view from the rear deck! Lots of pine trees and boulders though!! Energy efficient natural gas furnace with thermostat control and adjustable vent registers in each room. Clean comfortable linens provided for each bed. Two additional sets provided for each sofa bed. In garage or in front of the garage door. Room for one large vehicle or PU.Additional parking for smaller vehicle due to the hot tub enclosure. Full set of dishes for more than 12 people including silverware.Can opener, Blender Pots/pans/measuring cups, Griddle. Carving knives Crock Pot, Turkey Roaster Electric mixer, Cook Books & MORE! Complete gourmet kitched with all of the appliances measuring cups and utensils a cook neead to prepare your favorite meal. We even have some cook books! Seating for 8 around table and additional 4 seats at the breakfast bar. Ping pong table is at the club house! Pool table is available at the clubhouse for guest use. In Living room DVD'S and some old VHS even! Good for memories and entertaining kids with cartoons! No lawn, just trees boulders pine trees, pine cones and a carpet of pine needles. When it snows you can't see anything but the boulders and the trees! The call them decks up here and we've got two of 'em! Tennis courts are available at the clubhouse for our guests. The courts are open when there is no snow on them. Pool available at the club house for our guests. The pool is normally open late may through early fall. Private Hot Springs tub is located in a carpeted secure enclosure at the garage level A large exterior hot tub is availble at the club house. Local information available at the Visitor's information center at on highway 50 across from the Lakeside Inn/Casino Pool Table, Ping Pong. swimming pool, tennis courts, sauna, and fire pit and deluxe children's play area available to our guests at the Lake Village club house. There is no charge for our guest except for a minimal charge for the pool table. If you are looking for a great affordable home with everything you need for a fantastic memorable getaway Snowbear Lodge is the answer! Clean, comfortable, and great location! This house was amazing! It had enough space for all our party and Nancy was so great with making sure that we had enough space for our group. The house was very clean and spacious. I really enjoyed the hot tub being indoors as it gave extra privacy. Will definitely be booking this again in the future. Not to mention the location is super great and even the pullout bed is really comfortable !!! Thanks Darcie, You were great guests. I too have used the sofa beds! They are memory foam and don't have the bar in the center like the old style!! We;re glad you enjoyed your stay! The house was clean and well taken care of. It was comfortable and had plenty of space. We loved it! We had a great time. The house was comfortable and spacious, as well as, clean and well equipped with what we needed. The owner was very nice and easy to talk to. Would definitely recommend staying there. Thanks for your nice review and being such wonderful guests! We hope to see you again soon for another one of your educational group visits.. The description and pictures were very accurate. The home was very spacious and clean, and is well situated in a nice community and close to attractions. The owner was very nice, welcoming, and helpful. We would definitely consider staying there again. We really enjoyed our stay. We had a nice stay. The 10 of us had plenty of room. The kitchen was well equipped. My family and I stayed in this property for four nights. We had seven adults, two toddlers and a baby. This was a very comfortable house for all of us. We took a baby gate to keep the toddlers away from the stairs and that worked great, although one toddler could fit through the rails so we did have to watch her more carefully. Everything we needed was provided--even towels for the hot tub. We all loved the house. We were there for a family wedding and many other family members rented houses in the same Lake Village neighborhood. In fact, three other houses were rented. I did not see the other houses but when anyone came into our house the response was "Wow! this is beautiful!" So I assume ours was the best of the four. One family arrived to their rented house at midnight only to find a disaster! Not cleaned properly, things not working, etc. They demanded to be moved to a different unit which was okay but had to wait until 4 pm for the property to be cleaned. We had no problems, the house was very clean and everything worked. Nancy was super! I would highly recommend this house. Thanks you so much Susan, you were awesome guests!We hope you'll keep us in mind for a family trip when you can stay a bit longer! Lake Tahoe on the south shore near Round Hill and Zephyr cove Nevada. Less than a mile to all major attractions including the beaches casinos shopping and restaurants. Edgewood golf course is 1/2 mile from our home. We normally do not rent to guests under 25 years of age. THREE NIGHT MINIMUM, TWO NIGHTS ON SHORT NOTICE! WE MAY REQUIRE A 5 NIGHT RESERVATION ON ALL BOOKINGS MADE MORE THAN TWO WEEKS IN ADVANCE UNLESS THE PROPOSED STAY DOVETAILS BETWEEN OR INTO ONE OR TWO LARGER BOOKINGS.